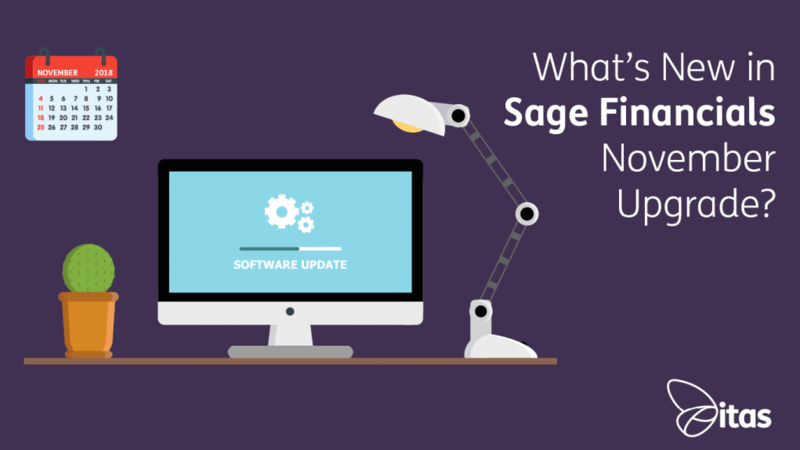 Sage Financials: What’s New in Sage Financials November Upgrade? Sage Financials: What’s New in Sage Financials November 2018 Upgrade? As November comes to an end and we welcome all things Christmas, it is time for some new features in Sage Financials (previously Sage Live). Available to install from December, this months upgrade is a pull upgrade*. Payment and receipt types can now be added to customer and supplier invoices. This will allow you to see how you intend to pay supplier invoices and also how you are expecting to receive money from customer invoices. A feature that will be beneficial for customers paying by SEPA Direct Debit due to payments being reliant on you requesting their money via the bank. All new companies by default will have this feature available. For existing companies, you will need to install the latest template for your region from System > Templates in order to see this new feature. Please note this feature is not available in Australia, Canada, South Africa, and the USA. Changes have been made to dimension rules to ensure that the default payment types are applied correctly to customer and supplier accounts. This is specifically applied to the behaviour when setting the Relationship Type. Not Applicable – Journals and transactions tags are not filtered. The related dimension tag can be left blank. The dimension rule for Customer with a related dimension of Receipt Type must use this relationship type. Optional – Journals and transactions tags are filtered. The tag can be left blank for the related dimension. The dimension rule for Sales Invoice Number with a related dimension of Customer must use this relationship type. Mandatory – At lease one default tag must be set per company and always selected for related dimension. The available tags are filtered on journals and transactions. The Help Menu has changed to show the relevant help topic that relates to the area you are in within Sage Financials. The help topic stays on the screen until closed, allowing you to reference the help whilst you work in Sage Financials. If you move to a different area within Sage Financials the help topic stays the same until you refresh it, either by closing and reopening or clicking refresh. This improvement is for UK companies only. The Balance Sheet is now presented in Assets – Liabilities = Equity Format. While this is potentially a smaller release than we have become accustomed to for Sage Financials, we await the next with baited breath as we see the introduction of the brand new Bank Reconciliation process. This is will be a huge overhaul for a fundamental part of the system which should simplify and improve the process. But for now, enjoy the new features of the November release! As always, if you have any questions regarding the latest upgrade or Sage Financials reach out to one of our team who will be happy to help! *Correct at time of publishing – subject to change. Home » Sage Blog » All Sage Blog Posts » Sage Financials: What’s New in Sage Financials November 2018 Upgrade?